Ramachandra Guha lives in Bangalore. His books include A Corner of a Foreign Field: The Indian History of a British Sport and The Unquiet Woods - Environmentalism - Savaging the Civilized. Ram writes a fortnightly 'Past And Present' column for The Hindu newspaper. In this essay he discusses Eduardo Galeano's Football in Sun and Shadow. Why is baseball alone among sports (with some challenge perhaps, from boxing) the subject of a distinguished literature, both fiction and non-fiction? As an American, Gould either did not know of or care to acknowledge the literature of a game called cricket. At his chauvinist claim one is tempted to throw the names of P.G. Wodehouse and A.G. Macdonell in the realm of fiction, and of Neville Cardus and C.L.R. James, speaking of non-fiction. I am a cricket-mad Indian. But I would like to answer Gould by writing about a game that is neither cricket nor baseball, and saluting what I believe to be the finest book about the world's most popular sport. It was written by Eduardo Galeano, a Uruguayan writer known for his historical novels and his denunciation of predatory capitalism in the classic Open Veins of Latin America. 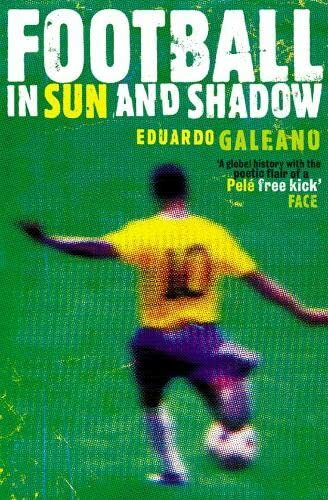 These other books shall endure, but it is more than likely that Galeano will ultimately come to be known as much by Football in Sun and Shadow, a marvellously idiosyncratic history of the sport. Football in Sun and Shadow is a mature work, the distillation of a lifetime spent watching and talking and dreaming about the game. For years [writes Galeano], I have felt challenged by the memory and reality of football, and I've tried to write something that was worthy of this great pagan Mass able to speak such different languages and unleash such universal passion. The book begins with a delightful account of how football took root in Latin America, and then takes the reader through the glory days of European club football. Each World Cup is described in a series of brisk vignettes. One theme that runs right through Football in Sun and Shadow is race. There is a loving description of the first great Brazilian footballer, Artur Friedenreich, son of a German immigrant and a Black washerwoman. Ever since, 'Brazil's best players... have always been Blacks and mulattos. All of them came up from poverty, and some of them returned to it'. For the Black child in the slums, 'the ball is the only fairy godmother he can believe in'. By contrast, 'there have been no Blacks or mulattos among Brazil's car-racing champions. Like tennis, it is a sport that requires money'. A second theme is nationalism. Galeano demonstrates the links between fascism and football in the Italy of the 1930s, and talks also of how, in his native Uruguay, the sport takes precedence over all else. Every time the national team plays... the country holds its breath. Politicians, singers and street vendors shut their mouths, lovers suspend their caresses, and flies stop flying. Galeano writes with an uncommon grace. The book reads so well in this translation by Mark Fried that one marvels at what it must be like in the original Spanish. The careers of both individuals and nations are summed up with a brilliantly witty concision. Thus when Germany played Denmark in the final of the 1992 European Cup, 'the German players were raised on fasting, abstinence and hard work, the Danes on beer, women and naps in the sun'. Happily, 'the singing cicada defeated the worker ant 2-0'. He played, he won, he peed, he lost. There are towns and villages in Brazil which have no church, but not one lacks a football pitch. Sunday is the day of hard labour for cardiologists across the country. On a normal Sunday people die of excitement during the Mass of the ball. On a Sunday without football, people die of boredom. With a novelist's eye, Galeano spots and foregrounds the telling detail. He speculates that Albert Camus played in goal because he grew up poor, and 'in that position your shoes don't wear out so fast'. We learn that Nigeria and Biafra, then at war, declared a truce to watch Pele play, and that Ruud Gullit once dedicated a Golden Boot award to Nelson Mandela, 'who had spent many years in jail for the crime of believing that Blacks are human'. Among the many snippets and stories in this altogether wonderful book, my own favourite is the account of the capture by terrorists of the Japanese embassy in Lima. When commandos finally stormed the embassy, the guerrillas were playing football, and their leader died wearing the colours of his favourite club. Galeano is scathing about the corruptions of the modern game. About the stranglehold of television he says that 'the game has sold out to the small screen in body and soul and clothing too'. He notes that the average number of goals in the World Cup has fallen by half: proof that football at that level is marked no longer by skill and finesse, but by the fear of losing. Everywhere, there is crowd violence, by hooligans who 'insult football the way drunks insult wine'. As for the players, in their desperate desire to win they abuse their bodies: they are 'running drug stores', representing not so much their country as the chemical industry. As often as not, officials and administrators are crooks: swindling shares, evading taxes, bribing umpires. World football, once run by the charlatan João Havelange, is now in the hands of Sepp Blatter, a man 'who never once kicked a ball but goes about in a 25-foot limousine driven by a Black chauffeur'. In these pointed descriptions we cricket-lovers can see the creeping contaminations, not just of football, but of our own sport as well. Reading Football in Sun and Shadow, I was tempted to compare it with C.L.R. James's Beyond a Boundary. Admittedly, the prose styles of the two writers are quite different. Galeano's is wry, economical and sardonic, James's expansive, magisterial and nostalgic. The Uruguayan writes in short, epigrammatic sentences and breaks up his book into many chapters, each running to not more than half-a-dozen paragraphs. The Trinidadian favoured long chapters and winding sentences. Still, where the books differ in style they resemble one another in intent. Both seamlessly locate sport in its wider social and political context. Both authors show a marked penchant for the (usually Black) underdog, yet both have a capacious pantheon. Galeano can write as evocatively about the Russian Lev Yashin and the Hungarian Ferenc Puskas as about footballers from Latin America, while James could frankly admit to, and document in detail, his admiration of the extraordinary English cricketer W.G. Grace. One might say that football has been to Latin America what cricket once was to the West Indies: not just a sport, but the chief vehicle of cultural expression, with the play and the players half-consciously mirroring the dilemmas and aspirations of society as a whole. Yet Galeano, like James, is no arid sociologist: he is a true lover of his game, steeped in its folklore and deeply knowledgeable about its practice and practitioners. The shelf of books on sport that count as literature is a small one. But on this shelf one finds both Football in Sun and Shadow and Beyond a Boundary, perhaps nesting - as they do in my home - side by side.